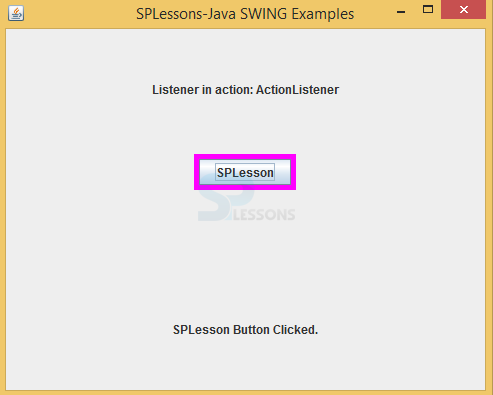 The Swing Event Listeners are backbone to every component to handle events, in Java there are more listeners, splessons will teach frequently used listeners and their functinalnity. Every method of a particular event listener will have a single parameter as an instance which is the subclass of EventObject class. 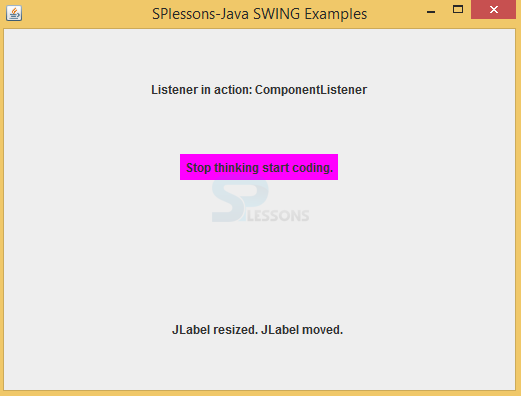 Swing Event Listeners interface needs to be extended and it will be defined in Java.util package. Following is the syntax for Swing Event Listeners. Following are the frequently used listeners in the swing. 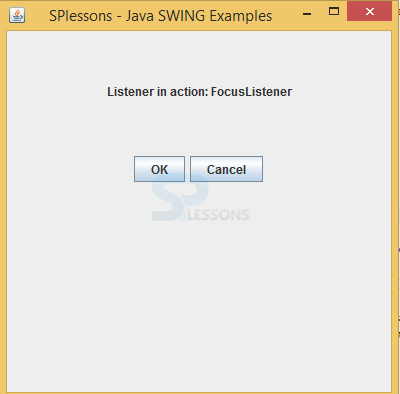 The class needs to be implemented this interface and an object of this class should be registered with a component by using addActionListener() method. Following is the syntax. ActionListener has been implemented here. JPanel Creates a new JPanel with a double buffer and a flow layout. JPanel(LayoutManager layout) Create a new buffered JPanel with the specified layout manager. 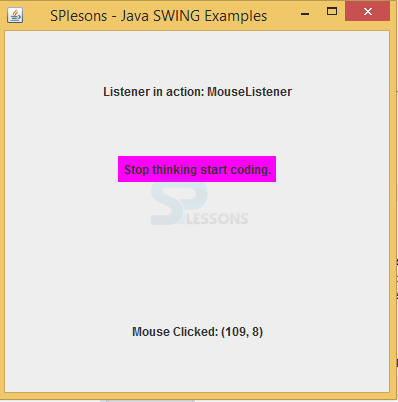 When compiling the code following is, the output will be generated, when click on the button it give listener alert. The class needs to be implemented this interface and an object of this class should be registered with a component by using addComponentListener() method. Following is the syntax. new JLabel("Stop thinking start coding." The class which processes the ComponentEvent should implement java.awt.event.ComponentListener interface.The object of that class must be registered with a component. The object can be registered using the addComponentListener() method. Component event are raised for information only. The class which process the mouse event needs to be implemented this interface and an object of this class should be registered with a component by using addMouseListener() method. Following is the syntax. To place buttons, text labels and other components on the program window, you need to understand about JPanel. It is a kind of container for components, which occupies the rectangular piece on the screen and shows the components arranged in some simple way. How exactly the components are arranged depends on which layout have you set to that panel. For the manual programming you will likely need to know at least the BorderLayout which places four components at the sides and one large component into the middle, then the FlowLayout which usually arranges them side by side into horizontal row and finally the GridLayout which arranges components into arbitrary n * m table. When compile the code following is the output will be generated . 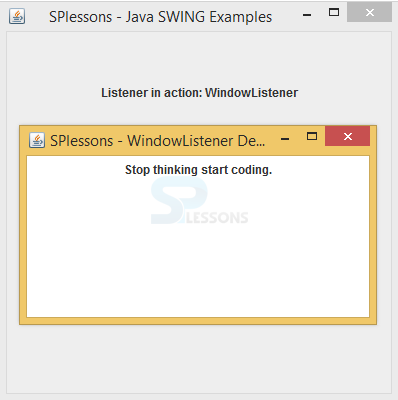 The class which process the window event needs to be implemented this interface and an object of this class should be registered with a component by using addWindowListener() method. Following is the syntax. To receive the keyboard focus events this interface will be used.Following is the syntax. The focusGained(FocusEvent e) is used to gain the window mean that when maximize the window, focusLost(FocusEvent e) is used to lost the focus mean that when minimize the window. When click on okbutton following output will be displayed. Swing Event Listeners – The JPanel class is a generic lightweight container. 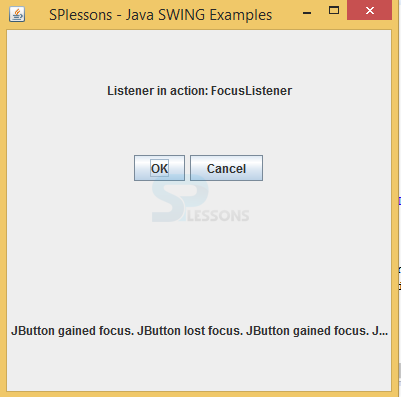 Swing Event Listeners – All the swing components will be available in java.awt.event. *; package.